Designing new nuclear facilities is an extraordinarily complex exercise, often requiring teams of specialists several hundred strong. 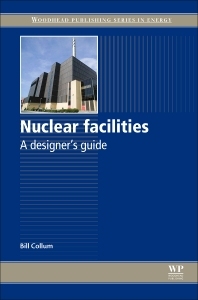 Nuclear Facilities: A Designer’s Guide provides an insight into each of the main contributors and shows how the whole design process is drawn together. Essential reading for all nuclear professionals: those already involved in the industry will gain knowledge that enables them to interact more effectively with colleagues in other disciplines. Its wealth of information will assist students and graduates in progressing more rapidly into fully rounded contributors to the nuclear facility design process. Whilst those joining nuclear from other industries will find a structured introduction to the nuclear world and discover what differentiates it from other spheres of engineering. Bill Collum is an independent consultant with over 30 years’ experience in the Nuclear Industry, gained both in the UK and overseas. He is one of the world’s leading experts in nuclear facility design, specialising in coordinating front-end Layout development from a blank sheet to a frozen scheme. A very useful guide providing valuable information in various fields pertinent to the entire life cycle of a nuclear facility (from the excavation of the uranium ore, through the manufacturing of the fuel assemblies and nuclear power plants, to the following decommissioning, decontamination and remediation processes - from cradle to grave), as well as to the very important areas of radiation protection and nuclear safety, and project management of new nuclear build. This book can be a useful guide to any plant design engineer involved in the construction of new nuclear power plants or any other facilities part of the nuclear fuel cycle.